Apple is releasing its Apple Watch on April 24th 2015. 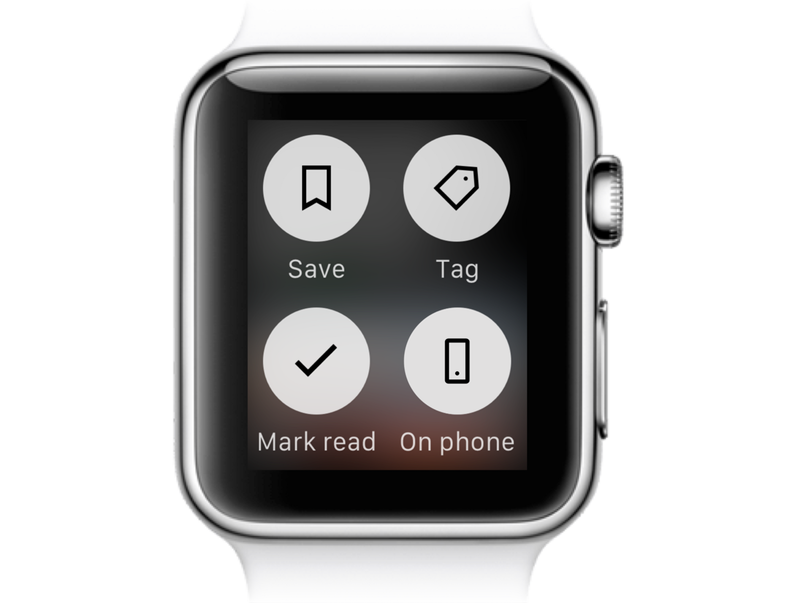 At feedly we decided to take some time and explore what it could mean for us to create an app for the Watch. After launching your Apple Watch app you will be presented with one of the 8 best stories from your feedly. Each story displays the information needed to quickly decide if it is worth reading entirely. You can scroll each story to view its first image as well as a short extract of its content using a scrolling gesture or the digital crown. You can also swipe right to view the next story. If you don’t want to read this story instead you can simply tap the check button to mark it as read and make sure it doesn’t appear on your feedly again. It’s really difficult to design an application for a device which has breakthrough use cases, new interactions but you have never tried. If that has happened to you in the past, what have you done to ease the design process? There seems to be no default icon for “continue on phone”. As you have seen I simply used an icon representing an iPhone. Do you think that works well? Do you have other ideas? I would love to hear if you have any suggestion or feedback! If you are interested in these kinds of design challenges, and you want to help people connect to the stories they need to keep ahead, shoot me an email! I am looking for a senior visual designer / Art Director to work with me on pushing the feedly brand forward and re-inventing the way people access and read content wherever they are. Don’t hesitate to send your portfolio to design@feedly.com. Thanks to Edwin Khodabakchian and Noelle Chun.